Pythian Consult, 2003, acrylic on canvas. 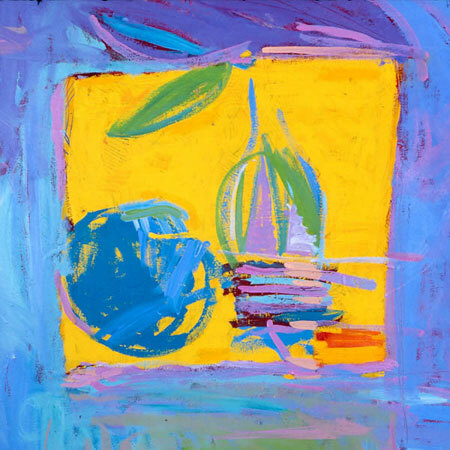 DC-based painter John Blee has lived an extraordinary life, with a richness of experience that radiates from his vibrant, abstract works. It’s difficult to imagine anyone with a more fascinating intellectual existence: speaking with John, it seems that he has read everything, tried everything – and remembers everything, which makes conversations endlessly engaging and unpredictable. 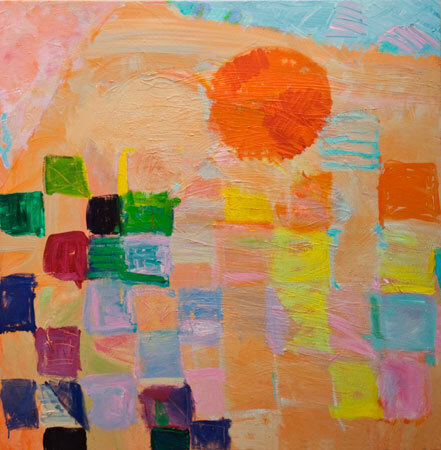 John’s work has been exhibited in New York (at the Andre Emmerich Gallery), in Boston, and Washington, DC. Outside of the US, his work has been shown in New Delhi, Moscow, and Paris (at Jane Roberts Fine Art). His work is in the collections of the Museum of Modern Art in New York and the Los Angeles County Museum of Art as well as the Museum of Modern Art in Yerevan, Armenia. Here, John offers us a glimpse of his universe and talks about the things that have have shaped him into the person he is today – and those that continue to influence and inspire him. You had an incredibly international upbringing. Can you tell us about that – and how those experience shape who you are today? I think the fortunate thing for me was that I lived in Asia and Africa as a child. Spending nine years in India and Pakistan continually resonates within me. It was my first five years and then after Pretoria and DC, I went to Delhi for high school. Being in the Indian subcontinent during childhood meant I absorbed it without judging it. When you are an adult you come with preconceptions to other countries and cultures. In childhood you just take it in. India is tremendously visual. And it is a continuous culture. It’s not like Greece where the Parthenon has nothing to do with the city below. Life in the village in India is still the antique, with all the pluses and minuses. With that there is a very different tuning into myth that is real, actual. When did you know you wanted to be a painter? Have you ever wanted to do anything else? At the age of fourteen (in Delhi) my parents had Laughlin Phillips, son of Duncan Phillips, to dinner with Susan Foster, an American painter who lived down the street. My father thought it was funny that people that came to the house thought that a picture of mine hanging in the dining room was done by an Indian artist. Sue saw the picture and remarked how good it was and looked at other work I had done later and said I was a painter. That was good enough for me, and I have never looked back. Of course there was the classical struggle with my parents who tried to get me to change my mind. It’s hard for me now to think of myself at fourteen with those thoughts. I have always been able to trust my own intuitive thinking. Imperative for a painter. Eastern Orchard, acrylic on canvas. All my mentoring was done by women. I always wanted to take painting lessons and started around twelve years old, though I had art in school (those were the olden days!) I had wonderful, wonderful guides. Without them I would not be who I am or be able to give of myself as I do when I teach. There was Sue, who was a disciple of de Kooning and Gorky, and a remarkable painter and draughtsman as well as an illustrator. She was very articulate and knew a lot about painting. I “got” the New York School through her. I borrowed her art books and poured through them. Sue took me to exhibition openings and I met Indian artists including Satish Gujral. I remember the opening of an exhibition organized by Octavio Paz, then the Mexican ambassador in Delhi, where he and Nehru spoke. Sue was a very loving mentor. Also there was my high school art teacher, Dorothy Rahman, who had studied with Carl Milles. She gave me tons of encouragement. Later I met Helen Frankenthaler when I was twenty, and she spoke to me as an equal. I greatly admired Helen’s work and was awed by her beauty and intelligence and wit. It all made me go further with my own work. During all that I went to MICA in Baltimore and Hunter College in NY to get my MA. There are the tried and true, like Bonnard and Indian miniature painting. Also when I go back to India it is the caves at Ellora especially the Dashavatara. It can be something unexpected like going recently to Amsterdam to the CoBrA Museum and seeing the Mogens Balle show [Note: You can read more about CoBrA in this blog post]. Or the Giottos in Assisi. In Delhi as a kid I went almost every week to see the Chola bronzes in the National Museum. They were and remain the hallmark of what moves me most deeply in art: the combining of the sacred with the sensuous. Poetry is very important to me and I would not have achieved what I have in my art without reading Rilke beginning in high school. The poetry of H.D. and knowing the poet, Hilda Morley, also resonate daily. Tibetan tankas, Indian miniatures, Mogens Balle, a Bonnard etching, Braque lithos, photographs by Tom Wolff & Philippe Grunchec. Probably a sculpture of Ganesh is my favorite. You’re an avid reader. What is the last book you read that you would recommend? It took me ages to finish “The Sword Went Out to Sea” by H.D. I only recommend it to her die-hard fans. The poetry of Julia Hartwig. Also Patrick Beurard-Valdoye’s poetry. Please describe a typical day in your life, if there is such a thing. Thinking, dreaming, reading, painting, housework, listening to music, walking the dogs. And I teach. What’s the single most important advice you have received in your life? What individuals have had the greatest influence on your work? Rilke, H.D., Bonnard, Coomaraswamy, Hilda Morley, Frankenthaler. What is your favorite place to paint and why? My studio. 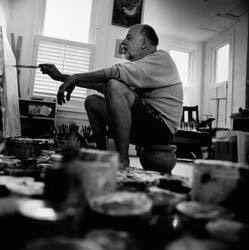 A painter is rooted to place and all my tools are there. What is your favorite art exhibit of all time? Why? Probably going into the Tibet House exhibition in Delhi in about 1966. It was astonishing and surprising, and influenced the space in my art. 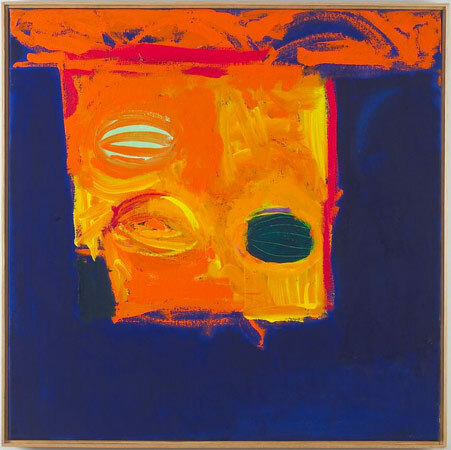 Seeing Helen Frankenthaler’s retrospective in 1968 was formative. Also the Turner retrospective at the RA in 1975. Where in the world would you most like to have a show of your work? Last year I spent part of almost everyday for two weeks I had in Paris at the Orangerie looking at Monet’s Nymphéas. I loved the Phillips Collection before they changed it recently. What painting tools have you mainly used over the last few years? To find happiness in every moment & to speak ten languages. I would love to read poetry in the original. Aside from being an accomplished painter, you’re also a writer, art critic, teacher… How do you balance it all with your painting career? You learn from every thing you work at. It’s good to be diverse as it takes you down unforeseen paths. What does your work offer our society? Hopefully it affirms other people’s interior being. That’s what I feel art offers: it makes what is most real more real. To learn more about John and see his online gallery, please visit John’s website. Amazing to come across this… Lovely interview! Wish I lived closer and could see some of John’s work. Quite rich and interesting blog too. Amelia, thanks so much for your great feedback! John is indeed a fascinating person and an incredible artist. No chance you’ll be in Paris this summer? He’s having a show there, I believe it’s in June.